Macrolepiota procera, the Parasol Mushroom, is a choice edible species found on roadside verges, in neglected pastureland and on grassy seaside cliffs in summer and autumn. Frequent in southern Britain and Ireland, Parasols are less common in northern England and Scotland except for sheltered coastal locations. This species occurs also in most parts of mainland Europe and in the USA. Shown above is quite the finest display of Parasols that I have ever seen. Growing on stable sand dunes on Morfa Dyffryn National Nature Reserve, on the coast just south of Harlech in North Wales, this slightly wavy line of fungal beauties extended some 80 metres, with more than 30 fruitbodies all in perfect condition. On National Nature Reserves in Britain it is an offence to pick wildflowers or fungi without special permission, which may be granted for research purposes. A fungal feast, no matter how innovative the recipe, certainly does not qualify as scientific research! In any case, this was such a perfect display and to do anything that would prevent other people from enjoying it would have been little short of vandalism. We went home empty handed and substituted Portobello Mushrooms - large Agaricus bisporus mushrooms from the supermarket - in place of Parasols in our recipe. The end result was not bad by any means, but not quite as special as our genuine Parasol Schnitzel. Originally described in 1772 by the Italian naturalist Giovanni Antonio Scopoli - his name is sometimes latinised to Joannes Antonius Scopoli - who called it Agaricus procerus. (Most gilled fungi were placed in the Agaricus genus in the early days of fungal taxonomy, but the majority have since been relocated to new genera.) The Parasol Mushroom was transferred to its present genus by the famous German-born mycologist Rolf Singer in a 1948 publication. Synonyms of Macrolepiota procera var. 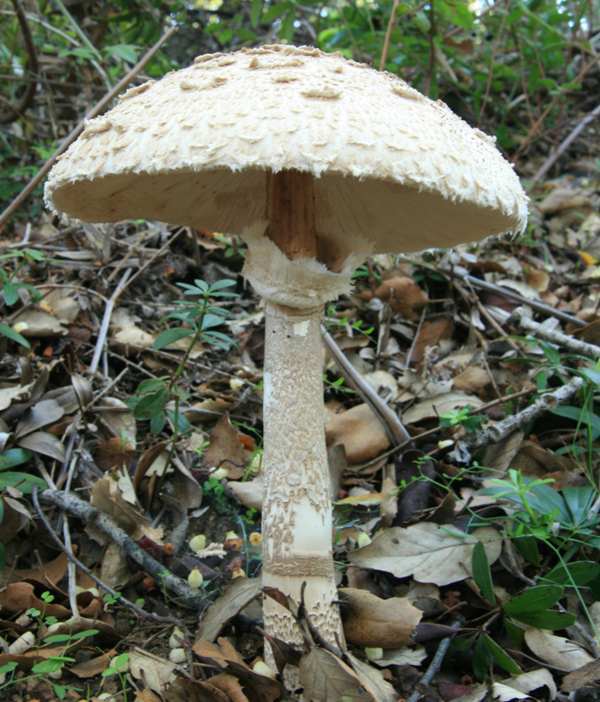 procera include Agaricus procerus Scop., and Lepiota procera (Scop.) Gray. Several former members of the Macrolepiota genus are now sited in the genus Chlorophyllum, which contains a number of large parosal-like fungi now known to be toxic to many people - for example Chlorophyllum rhacodes, the Shaggy Parasol. Macrolepiota procera is the type species of the genus Macrolepiota. Two varieties of this species are formally recognised. the nominate form, var. procera, is illustrated here. Macrolepiota procera var. pseudo-olivascens Bellù & Lanzoni, was defined in 1987 and is generally found under conifers; it differs visibly in developing olive stains on the cap surface. The specific epithet procera means tall, an adjective wholly appropriate to these stately mushrooms. Initially spherical and pale brown with a darker brown area near the crown that breaks into scales, the cap of Macrolepiota procera expends until it is flat with a small central bump, known as an umbo. 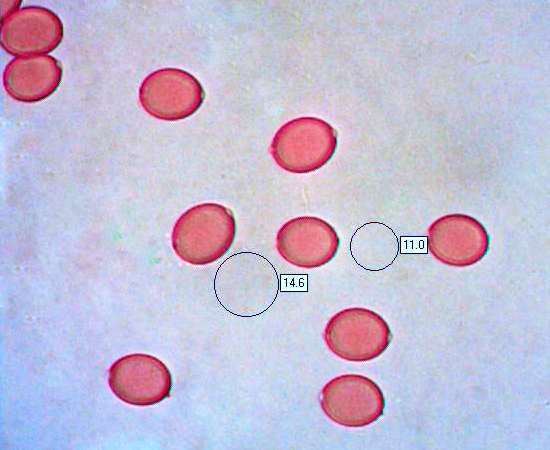 The cap flesh is white and does not change significantly when cut. The cap diameter at maturity ranges between 10 and 25cm. 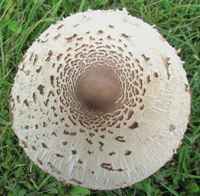 The broad, crowded gills of the Parasol Mushroom are white or pale cream and free, terminating some distance from the stipe. 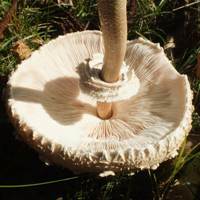 A large double-edged ring persists around the stem of Macrolepiota procera but often becomes movable and falls to the base. 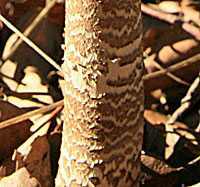 The stem is smooth and white or cream but decorated with small brown scales that often give it a banded, snakeskin appearance. Inside the stem the tough white fibrous flesh is loosely packed, and sometimes the stem is hollow. Bulbous at the base, the stems of Macrolepiota procera tapers inwards slightly towards the apex; the diameter ranges from 1 to 1.5cm (to 2.5cm across the bulbous base), and the stem height can be up to 30 cm. 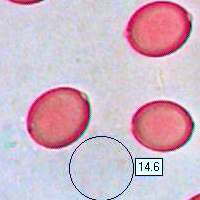 Ellipsoidal, smooth, thick-walled; 12-18 x 8-12µm; with a small germ pore. Odour not distinctive; taste sweet. Parasol mushrooms are saprobic. They are most common in woodland clearings and in grassy areas next to woodland, growing alone or in small scattered groups; also occasionally in permanent pasture and in stable sand dunes as well as (although rarely) on disturbed ground such as in gardens and allotments. 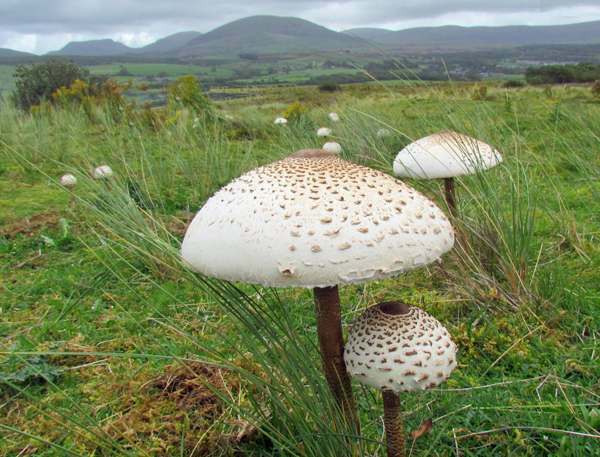 July to November in Britain and Ireland; later in southern Europe..
Chlorophyllum rhacodes, the Shaggy Parasol, is smaller than Macrolepiota procera but it has larger, reflexed scales and a stipe that lacks the brown snakeskin patterning. It is important to learn to distinguish between these two species, as for a large percentage of people the Shaggy Parasol is poisonous. If you gather these large meaty mushrooms to eat, be aware that the somewhat similar Shaggy Parasol, Chlorophyllum rhacodes, can cause tummy upsets. 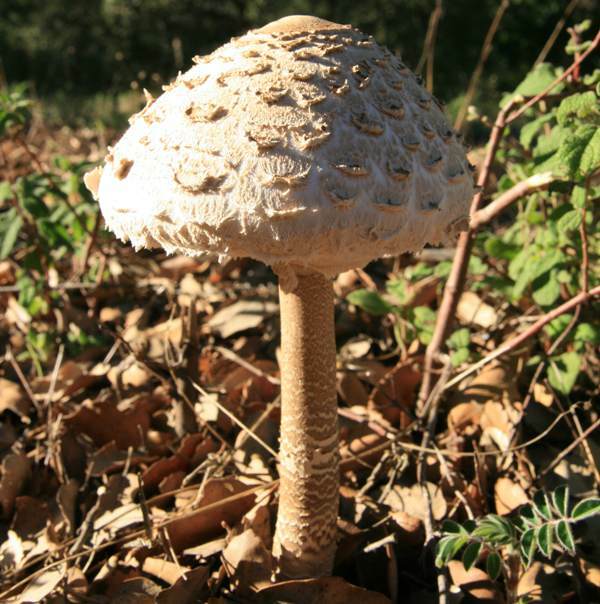 The Shaggy Parasol has flesh that turns red when it is cut, and its stem lacks the snakeskin-like patterning. Parasol Schnitzel is my favourite when using this mushroom in a meal. It fully deserves it place in the Magnificent Seven (seven fantastic free food fungi and how to cook them - see Fascinated by Fungi chapter 10.) 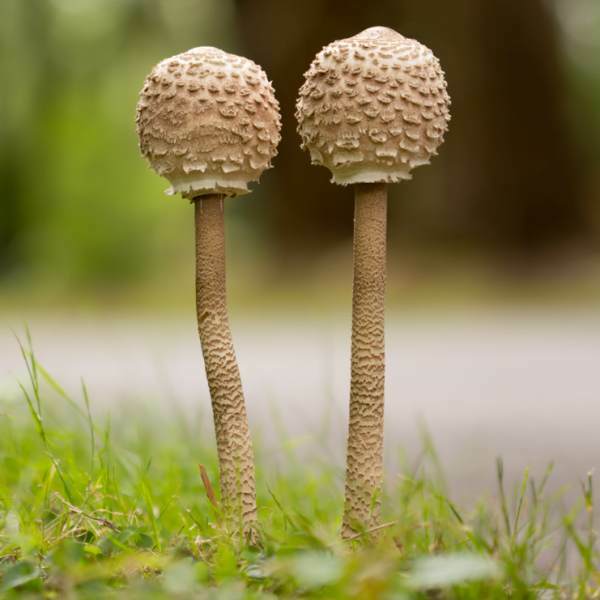 If you are new to gathering wild mushrooms for the pot here are a couple of tips to help you when gathering Parasols. First, avoid small specimens. It is possible to find examples of Lepiota procera with caps smaller than 10cm across when fully expanded; however, they make only modest meals and, more importantly, you could by mistake end up collecting some of the small poisonous Lepiota species (nowadays referred to as 'dapperlings' but still recorded as various kinds of 'parasols' in some reference books). One simple way of minimising such risks is to shun any specimens with caps smaller than 10cm across when fully expanded; but do also check carefully the other identifying characters of this delicious mushroom. This page includes pictures kindly contributed by Neil Crummack and David Kelly.